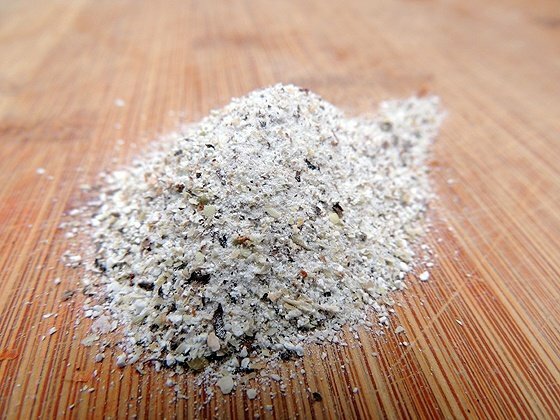 In this post, I’ll show you how to process buckwheat and how to make buckwheat flour. This is not the “right” way to do it… Just my way but it worked for me and I was able to dehull buckwheat, mill it, and make my own buckwheat flour. You can make your own buckwheat flour in a few different ways and I’d like to share my way with you. It was a fun project! I didn’t title this post “How to Process Buckwheat,” because quite frankly, this is not how you should do it. In fact, after this past week, a few people officially concluded that I have gone mental. 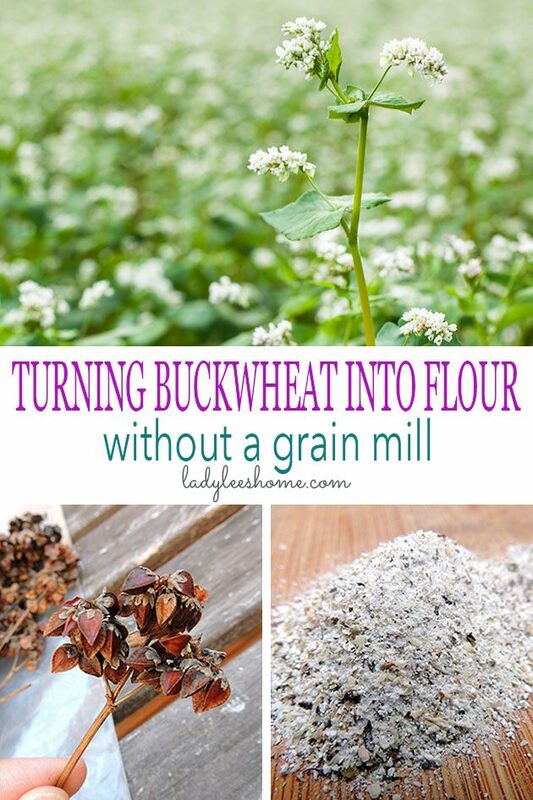 You see, if you were to grow buckwheat (which I strongly recommend for many reasons listed below), and make your own gluten-free buckwheat flour, you would probably want to use a grain mill like the Country Living Grain Mill and then, follow their instructions for dehulling and grinding the seed. But what’s to me, Lady Lee, and following instructions? Absolutely nothing. I am known around the family for doing things backward, upside down, or sideways. And I wouldn’t want to ruin the reputation I worked so hard to build, now would I? So I went ahead and planted a whole field of buckwheat. Yeah, you read that right, I said a field. The plan was to use the buckwheat in the compost heap and to till it under as green manure at the end of the summer. Then, plant the field with winter cover crops (read: Learn How Cover Crops and Green Manure Crops Will Change Your Garden). Don’t ask me why. I really have no clue. What did happen is that the buckwheat went to seed, reseeded itself, grew again, and went into seed again. At that point, it was too cold outside for the seeds that dropped to the ground to germinate, and many others stayed on the dry stems that were still standing in the field. I was so busy preparing the other end of the field for spring planting that I completely ignored the buckwheat. I was trying to measure and mark the beds of vegetables for next year. One child was pulling the stakes out of the ground, the other was messing with the twine, while the last one was stepping all over the bed after I removed him and explained 17 million times that we DO NOT step on the vegetable beds. Can’t a one and a half-year-old understand the principles of soil compaction for crying out loud?! Anyway, it was either going for a walk or having the neighbors call child services. So we went for a walk… And came across a field of dry buckwheat. I am not sure what is it about kids, but they love to pick stuff. 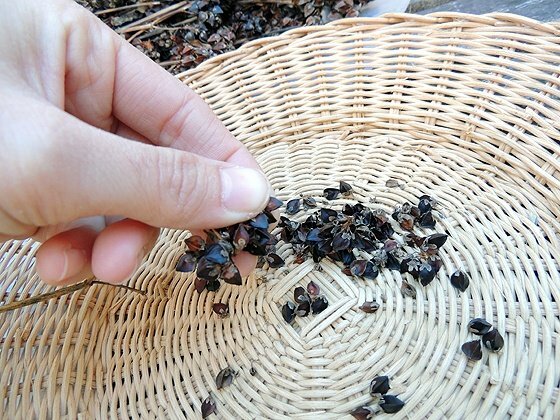 So they started picking those wonderful stems with the clusters of dry seeds on top and I joined in. We ended up with a nice bunch of buckwheat to take home. 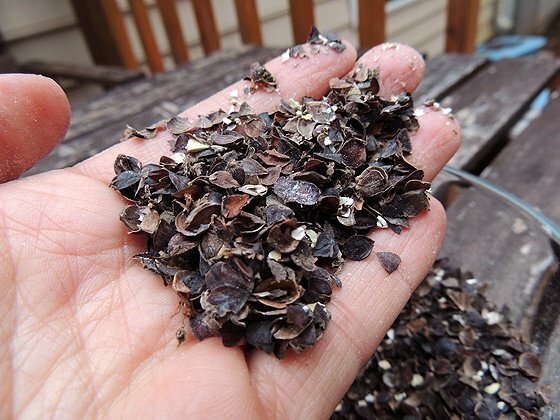 Even though my initial plan was to plant buckwheat as green manure this time around, I always wanted to grow grains and seeds (buckwheat is a seed and not a grain because it doesn’t contain gluten) to make my own flour. If I can grow grains for us and turn them into flour, I can, in my eyes, pretty much do anything. OK, maybe I can’t go running naked around downtown, or drink from my nose, or say – meet the Kardashians – but seriously, who wants to do those things anyway? It grows super fast. 4 weeks to flower and another 4 weeks to seed. It grows in any soil. No special soil requirements. The bees love it. Buckwheat honey is said to be black and delicious, and one’s gotta help the bees if one can (read: 61 Plants That Attract Honeybees). It seeds itself. The seeds just drop to the ground and germinate. The flowers are beautiful. A cluster of tiny, white flowers. You can cook the seeds as a side dish just like rice (if you break them a bit, not mill them all the way into flour). 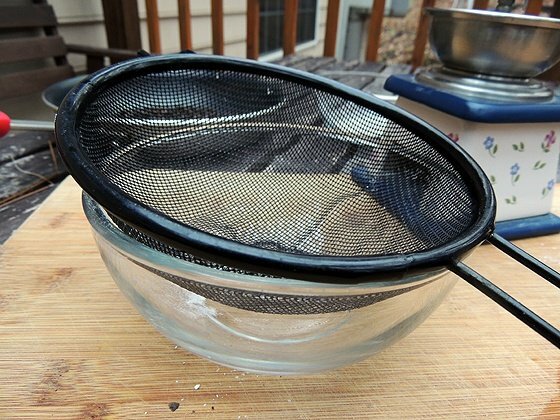 It makes gluten-free flour (great for a gluten-free diet). Buckwheat has so much protein in it. It can be used as a substitute for meat. It’s a great companion plant. If you have a bed of tomatoes, for example, you can plant buckwheat around the tomatoes. It will suppress weeds, attract pollinators, and no special spacing is required. It’s great for our digestive system. It can help reduce blood pressure because it’s a good source of magnesium. You can use the hulls as mulch. Or you can make a buckwheat pillow! (This looks like such a cool project). But the reason I didn’t grow seeds or grains until now is that I don’t have a grain mill. Simply can’t afford it at the moment but I know that I need it if I want to process grains. So what was I going to do with all those buckwheat seeds? I wasn’t sure, but I started by separating them from the stems and cleaning them a bit. I also removed a bunch of empty seeds. Anyway, I was trying to find a way to de-hull those seeds. Not. An. Easy. Task. I found someone online suggesting to put them in a blender. It didn’t work. I cooked them, used a rolling pin, sang to them, and begged. Nothing worked. And then I remembered! 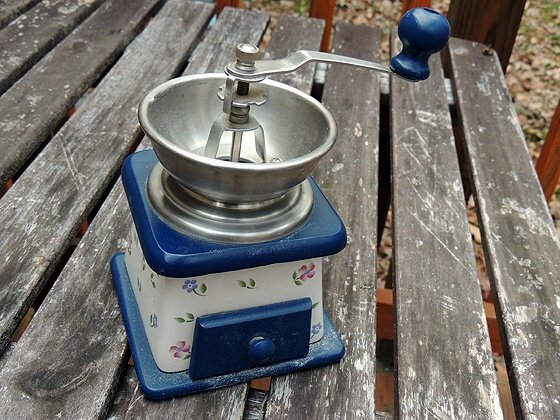 I remembered I had this beautiful spice grinder that I once gave my mother-in-law as a present but then took back because she had two. What? She doesn’t need two! Well, anyway, I gave her the poor-girl look, and she told me I could take it. She still loves me. I think (**Update – she doesn’t love me anymore because I am divorcing her son, oh well). I will try to explain how it works. You unscrew the top part, then screw the gear (the plate with the teeth) up or down. This controls the space between the two grinding stones at the bottom. You can see them here. 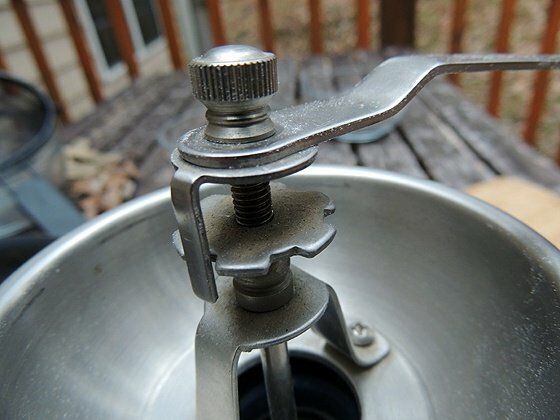 Once you have it set to the space you want (when the stones are close to each other the grinding is finer, when they are spaced apart, it is more coarse…), you screw the top back on which holds the handle in place. You place the spices in the bowl, let’s say, black pepper, and turn the handle that turns the stones that grind the pepper. Then, there is a cute wooden drawer to catch the ground spices. What a great present to give to someone… And then take back. The ultimate goal here is to separate the seed from the hull. If you do this with a machine that was made for this task, you should end up with a bowl of creamy de-hulled seeds that you can then run through the grinder again and mill into flour. In order to open the hull but not crush it, I opened the space between the stones to a rather large one. I’ve learned, the hard way, of course, that anything you want to do with buckwheat seeds works much better if they are super dry. 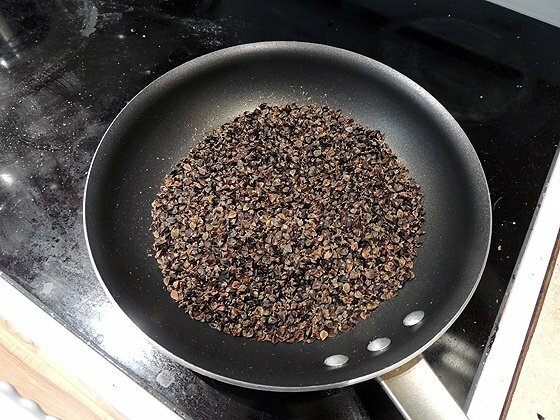 So before I ran them through the spice grinder, I placed the seeds in a pan and turned the heat to medium. I roasted them for about 7 minutes or so, stirring constantly, so they didn’t burn. I let the buckwheat cool for a few minutes and then added a small amount to the bowl of the spice grinder. I turned the handle a few times, and here is what I got. Dumped the content of the drawer in the colander and shook it over the bowl. Ta-da flour! Well, it’s not pure white flour, it’s got some tiny crushed hulls in it, but I am looking at it as whole wheat buckwheat flour. Gotta stay positive. You can keep working it and maybe run it through a finer strainer or run it through the spice grinder again if you’d like. These are the hulls. 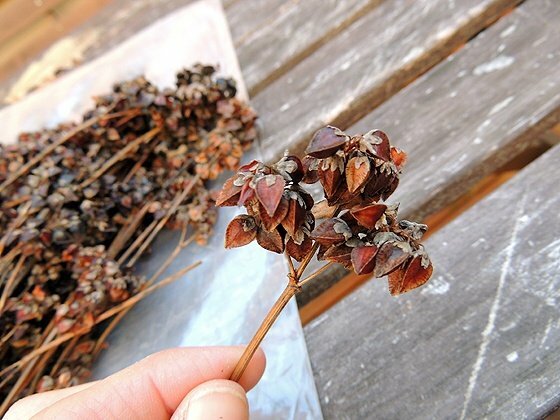 As I said before, you can use them as garden mulch, or make a buckwheat pillow. Also, I am sure my worms will love them. I ended up with about a cup of flour. A lot of my seeds were sacrificed in my scientific experiments. The good news is that there are still a lot of plants in the field. So I have more to work with. I see a batch of homemade buckwheat pancakes in our future. Don’t be concerned if people think you’ve gone mental. Don’t follow the rules, make them. Take your kids on as many walks in nature as possible. Plant something. It doesn’t have to be a whole field. A pot of green onions is good enough. Always, ALWAYS, see the positive side of everything! OK, I am off to meet the Kardashians now. You are so funny! I am so excited to grow buckwheat. I love the flour. Thank you for all the information. You are welcome! I hope you’ll enjoy your buckwheat. Actually, I know you will. Come back to tell me if you ended up harvesting and processing it. Happy new year to you too, Chris! Also, I am pretty much in love with that spice grinder! I know! It is so cute. I got it in Israel somewhere… But I can’t remember where. With seven kids and a small urban farm, I totally loved this article…really hit home. It’s great people thinking your nuts! With all the craziness going on in this world disguised as normalcy, I think people thinking you’re crazy means your on the right track. Can’t wait to get a bigger piece of property, so I can try stuff like this out. Thanks for the laugh and inspiration. You are welcome! I hope to one day have seven kids. They drive me crazy sometime, but I can’t imagine life without them! I grew several rounds of buckwheat last summer with the ignore, reseed itself method. We haven’t had a freeze yet so I still have some flowers for the bees which is part of my motivation for growing it. I’ll have to go collect the seeds so I can make some flour and have pancakes. Happy New Year! So, can you grow buckwheat year round down there in South TX? I can’t believe you didn’t have a frost yet! And I would totally grow it only for the flowers and the bees if I didn’t want to use it for anything else. The flowers are beautiful! You can plant it between anything, pretty much. Peppers, peas, squash, cucumbers… Really anything. I think they call it “companion planting” or “double planting” or something like that. Oh MY GOODNESS!!! This was great! 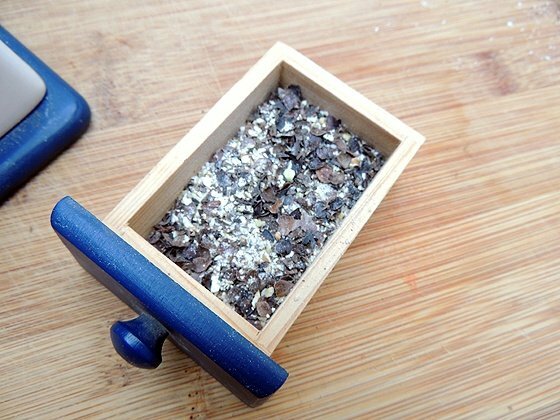 I have been all over the internet looking for a way to grind these seeds up, and this makes the most sense! I’m glad your crazy inventiveness paid off! And thank you for this funny and informative article – I laughed out loud! 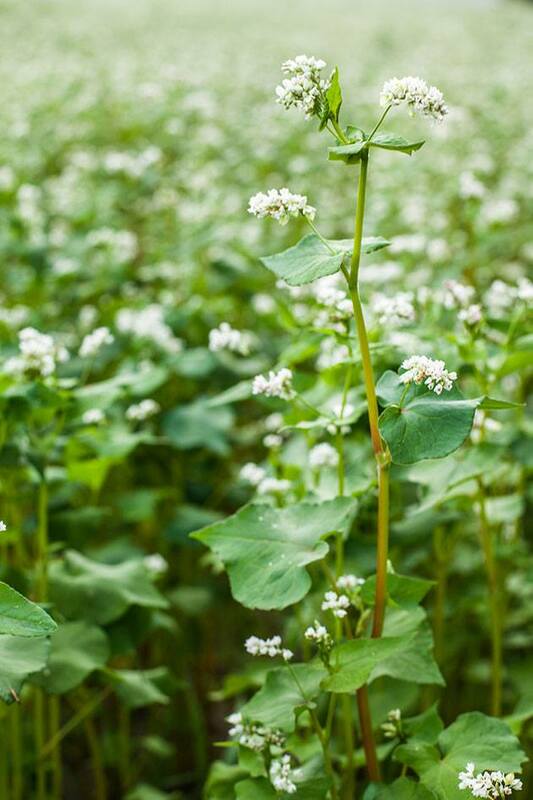 Anyway, remember that you can use your buckwheat as green manure and till it under a week after it starts flowering if you don’t want to deal with making flour. I really want to grow buckwheat for flour but I will have to wait until I get the right grain mill for the job. Ah, well – it’s been fun to grow, and if all I get is flour, so be it. where i should get this dehull machine . Country Living Grain Mill is the company that has the non-electric one. They might have others too. I had the same dilemma – how to crack those uniquely shaped hulls and salvage the seed inside. They are tough little nuts to crack. I tried my Nutrimill grain grinder and ended up with a fine grind but with the ground hulls in it. Buckwheat is a very “filling” grain to begin with. Adding the hulls to it – not so good. You show a picture of an opened hull with the intact seed beside it. That’s the result I’d like to get. 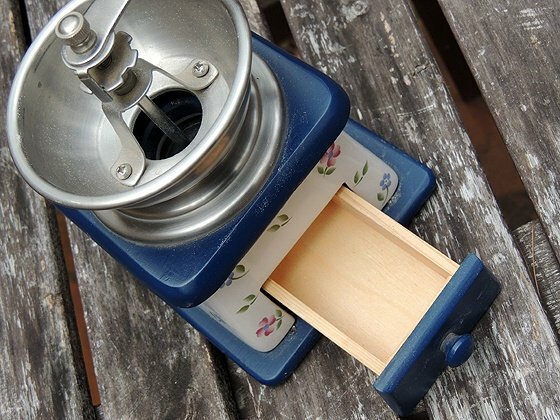 Did you achieve that with your little spice grinder? Does that grinder have stones or metal plates in it? 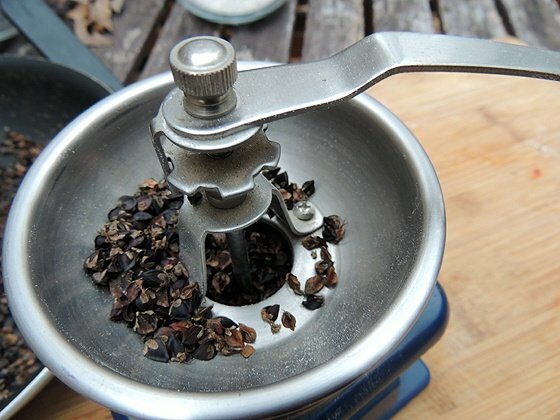 I should think a grinder with a top and bottom stone adjusted to the seed size would allow you to get the right result. it might work but I don’t own this grain mill so I don’t know. Are you buying all your grains in berries and grind them yourself? It something I wanted to do for a while but never got around to setting this little operation up… How does it work for you? 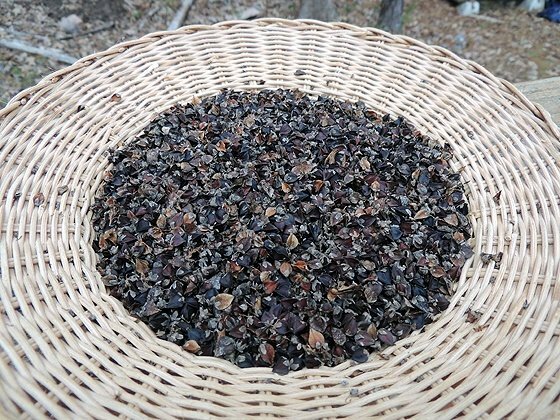 He talks about visiting a commercial mill that uses two heavy grooved-stone rollers that cleanly separate the husk from the seed. He prefers using an all-metal hand crank grinder that can give him similar results to the commercial miller. I’m looking to get one and try it out. I use a combination of milled whole wheat and King Arthur for baking for my everyday breads. There’s a great book (visit site: http://www.artisanbreadinfive.com/ ) that shows you how to have fresh baked bread easily and whenever you want. The NutriMill makes short work of grinding wheat berries, etc. 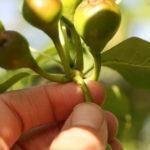 Certain oily seeds can’t be ground though because it will gum up the blades. Got a good deal on it through ebay. Thanks! 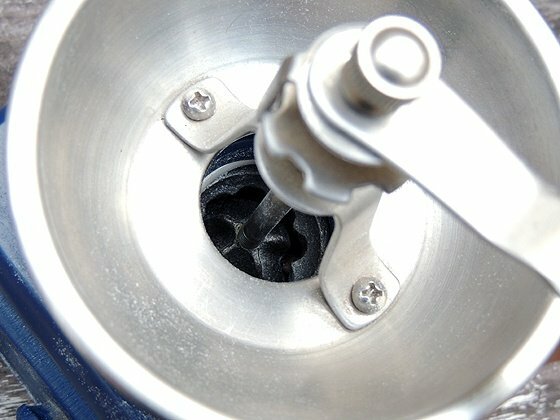 Please let me know if (and where) you find an all metal grinder. 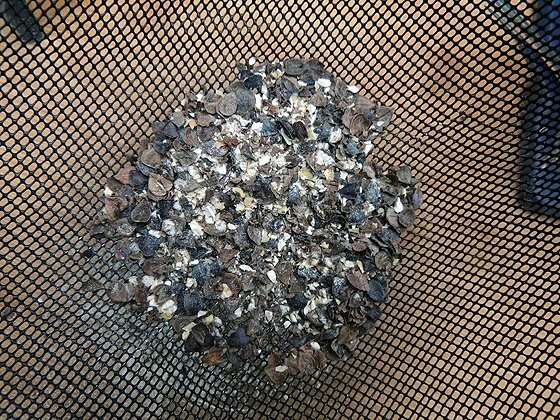 It seems like it is a possible task — to mill buckwheat at home — IF you have the right equipment. I don’t think I’ll try to grow it again until I have the right equipment. I am planning to strat a few bee hives next year and I would love to grow buckwheat for them so hopefully I can find an affordable grinder by next year. Also, where online do you get your wheat berries? You can get a decent metal grinder on ebay for short money. I purchase my organic grain from pleasanthillgrain.com. Depending on where you are, you might be able to purchase it at a better price locally. They also sell every kind of grain grinder you could want. Also, check out craigslist for your area or your local charitable organization (if they run a store for second hand goods). Flea markets and yard sales are another way to find what you’re looking for. I’m going to plant some buckwheat this week for my bees. We’re deep into a heat wave here right now and the nectar flow is starting to dry up. I just started beekeeping this Spring. I purchased two packages and put my name on a swarm list with my county. The phone was ringing! I now have 3 hives and playing catch-up with my bee equipment. I’ve had to refer the rest of my swarm calls to other beekeepers for lack of equipment and real estate to keep them all. I built two different types of hives. Being from New England, I built an insulated, double-walled golden hive and thought I’d use that same concept to build an insulated, double-walled top bar hive. The bees have done very well in both. There are some great free building plans on horizontalhive.com if you’re interested in building your own. Lot of good FB groups for beekeepers – even your local county should have a page there or a website. I’ve posted on Tri Gable Lea Bees, Organic Top Bar Beekeeping, JPthebeeman, etc. – to name a few. Don’t know if you’ve done any research on beekeeping but highly recommend reading Michael Bush’s “The Practical Beekeeper” – all natural approach. Very common sense stuff and easy to understand. Also, check with your county for classes and hands-on with people who are actually keeping bees. Best advice, have more equipment than you need because at some point you’ll wish you had it. So far, couldn’t find anything in thrift stores and flea markets. I never shop on e-bay. I’ll try. What do you mean “put my name on a swarm list with my county”, people gave you the hives and the bees that you have now? I am on the email list for my county’s beekeepers and they have a 9 week class that starts in January that I am planning to take. Right now, I am trying to figure out how much money I need to put aside so I can get everything I need after the class. I’ve been using Ebay for over 10 years. I don’t buy a lot, but it’s my “go to” place when I’m looking for something I can’t find locally and/or affordably. I’ve sold a few things too. I took my local county beek class in January 2015. After much reading, I understood that catching a local swarm of survivor stock (a/k/a feral bees) would be much better than purchasing a package. We had such a bad winter there were very few swarms that year so ended up with no bees but a did a ton of reading. My goal was to build a better bee hive and have healthy treatment-free bees. This year, 2016, is just the opposite. We had such a warm winter, even experienced beekeepers were dealing with swarming. Our county keeps a swarm list so if someone in the area finds themselves with a swarm of honeybees in their trees, bushes, etc. they can find us by going online and checking the list or calling someone in our association. Swarms are easier to catch because they haven’t settled in and started building comb yet. They are at their most docile (usually) at this point. Depending on how easy they are to get at, you just dump them in a box and take them home. Doing a “cut out” is a very different story. People discover bees in their attic, in their walls, barns, etc. and now you’re looking at some carpentry along with cutting comb and fitting it into frames. Very messy and the bees can be aggressive. I got 3 calls in June for swarms. The first was a swarm that landed on the side of someone’s foundation and by the time I got there they had moved into the crawl space underneath the bathroom and were building comb like crazy. The homeowner had to pull out the bathroom sink cabinet and cut a hole in the floor so I could get at them. I had to build a bee vacuum (quick and a hurry). They were great bees and thankfully hadn’t got too far along with the comb building. I put them in a nuc and they have settled in nicely. Free bees and appear to be healthy and hardy. If you want lessons on swarm catching and cut outs check out JPthebeeman on FB. He videotapes a lot of his cut outs. Watching them gave me the confidence to attempt it and discovered I could do it. The point is, you’re better off catching local swarms because these bees are primed for settling into a hive right away and getting down to business. If you can do cut outs – even better. Usually these are bees that have been tucked away for a number of years in an attic, soffit, wall, etc. They are “local survivor stock”, which is better because these bees have survived without human management. No sugar syrup, mite treatments, etc. They managed themselves. Package bees can be a hit-or-miss deal because the bees are usually piled into a box from different hives. They’re not always healthy. 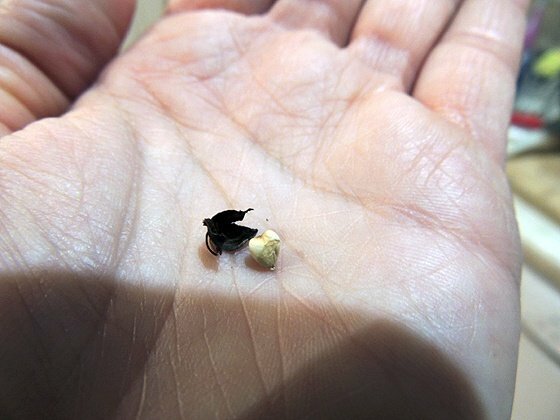 If you don’t have enough young bees, the package may not be able to build itself up to a thriving colony. Check to see if your county keeps a swarm list. You can also check with your local police and fire and leave your name and number in case they get a call for a swarm of bees. One other thing, if you have any local pest control companies, contact them and leave your name and number for swarm and/or cut out services. The homeowner who had bees in their crawl space had called a pest control company first. They identified the insects as honeybees and told them to call a beekeeper because they wouldn’t exterminate them. Lucky me. Beekeepers that do cut outs charge anywhere from $200 on up (depending on the amount of carpentry involved). It’s a good way to get free bees and maybe a few extra dollars in your pocket if you can do cut outs. Good luck with bee school. Beekeeping can be fun. And I enjoy just watching them. They are amazing creatures! What great information! Thank you so much (and thanks for mentioning pleasanthillgrain.com, what a great site!). I never heard of a swarm in our area and I have lots of country friends. In fact, you don’t see honey bees in our area at all, many many wasps but no honey bees. But, of course, I might be missing something… We do have a local beekeeping store, though. They might be a good source too and my friend bought a few packages of bees from them (as you said, the first group died, they weren’t strong at all and she has to keep feeding the second group). I’ll check around. Thanks again! I know you are busy with the family (great looking group) but one final note. Even though you don’t have bees, you can start helping them now. How? Learn what plants bees thrive on. Bees are close to becoming endangered and the more you can do to help them the better. Get the kids involved. Reach out to members of your local county’s beek assoc. You may be pleasantly surprised how many people actually have successful home apiaries. If you’re in NC, I believe there are a number of commercial apiaries in the state. If you have the time, you can ask to volunteer at someone’s apiary to learn first-hand what it takes to successfully keep bees. We just moved to this house and there was so much to do that landscaping will have to wait for next spring but I will definitely consider plants that bees like. Meanwhile, I planted some zinnias for my girls to pick and I know bees love those as well. Thanks for all the tips!